It's no secret that Johnny Depp harbors rock 'n' roll dreams behind his eccentric movie star pose. As he wraps up filming "Black Mass" in Massachusetts, the guitar-slinging actor has made do by crashing big-time area concerts, including Aerosmith's Thursday night. 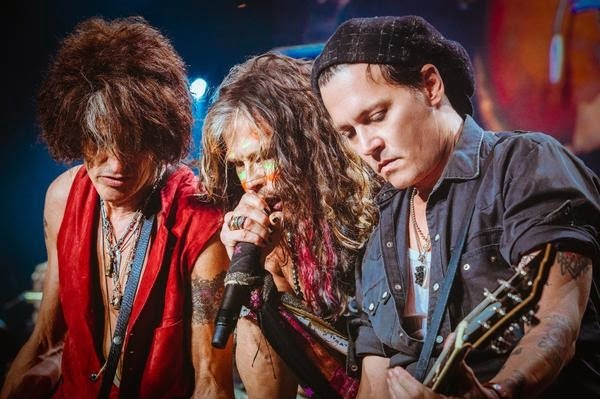 As seen in a video captured by a fan, Depp made a surprise appearance at the band's Xfinity Center show in Mansfield, popping up to join Steven Tyler and Co. for an encore performance of "Train Kept A-Rollin'." His fiancée, Amber Heard, reportedly was hanging out backstage. Aerosmith guitarist Joe Perry approved of Depp's wailing solo, tweeting a shout-out to the actor and fellow guitarist Slash, who also appeared that night. Depp has had some practice wielding his axe for huge crowds: In June, he jumped on a Boston waterfront stage to play guitar alongside Willie Nelson. And he's jammed with Aerosmith at least once before, having joined the band in Los Angeles for a 2012 appearance at the Hollywood Bowl. At this rate, the actor may have to start issuing tour T-shirts. Labels: Johnny Depp crashes Aerosmith show and gets 'A-Rollin' with Steven Tyler on http://moitresjolie.blogspot.com/.